The name of Christo Javacheff is always associated to that of Jeanne-Claude de Guillebon, because he carried out the greater part of his artistic work with his wife, who mainly tended to organizational aspects and to keeping the necessary contacts. Both artists were born in 1935 (Jeanne-Claude died in 2009), and met in Paris, where Christo, born in Bulgaria, arrived after having completed his studies in Sofia and in Prague, city that he left in 1956 because of the Soviet invasion. One of their first works, Rideau de Fer (1962), a metaphorical Berlin wall composed of oil barrels that blocked off a small street in Paris, was a reminder of and statement on that experience. Their interest in ‘wrapping’, initially small objects, aroused the interest of the Parisian artistic milieu, where Christo joined the Nouveau Réalism group. 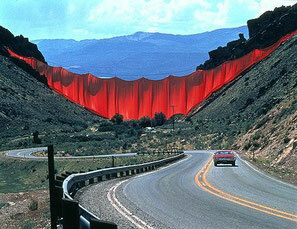 After moving to New York, the scale of their interventions progressively increased, to the point where it took on enormous and at times colossal dimensions, such as in Valley Curtain (1970-72), a 400 meter long cloth stretched across a valley in Colorado, or Running Fence (1972-76), a metaphorical ‘hedge’ running across the California countryside for over 40 kilometers. In more urban settings, for example, monuments such as Porta Pinciana (1974) in Rome, the Pont Neuf (1985) in Paris and the Reichstag (1995) in Berlin ended up ‘wrapped’. More than actual land art, in the case of Christo and Jeanne-Claude it is perhaps more correct to talk of environmental art, because the intervention takes place in different settings, natural or urban, that are never damaged, also due to the brief life-span of the pieces (for example the duration of the Running Fence was 14 days, after the 4 years that it took to complete it). That which the artist is interested in is the gesture, albeit brief, that arouses awareness for the context, be it in a natural or urban environment, for the forms and volumes of monuments which, precisely for this purpose, are ‘covered’.